A favorite summer pastime was fishing for largemouth bass on the Sebec River near the old swimming hole Down Back in Derby, Maine. Sunfish were no challenge, but the biggest, and therefore oldest, bass got that way for a reason. They’d seen it all, and one in particular was legendary. We called him Grandaddy Bass. Nearly every day during the summer at least a handful of us youngsters spent time Down Back playing, swimming, fishing, or rafting on the river. Grandaddy Bass was elusive, and years might pass without an appearance. If your timing was perfect and you had a rod in your hand at the moment he showed up, the adrenaline rush was incredible. The sheer size left no doubt you were facing the legend. With hands shaking, in most cases you fumbled to change tackle trying to come up with just the right appetizer. If you were caught without a rod, you still stared in awe. In one meeting, the tackle box was left at home because I was fishing using a spinner and hook with earth worms dug from the riverbank. After a half hour of casting to just the right spot so I could reel the bait past his nose, I finally gave up. As I turned to leave, an 8-10 inch green grass snake slithered by and I picked it up for a closer look. Not thinking, and later not realizing why, I gave it a toss about 5 feet out into the river, and then watched as it gracefully swam away. The snake was headed for the opposite shore and made it about a yard, and suddenly… bam! 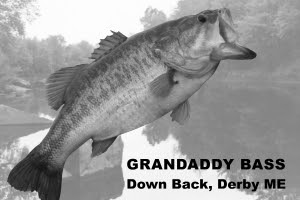 The greenie was gone in a violent splash, and I saw just enough during that instant to know it was Grandaddy Bass. The circumstances of rod in hand, a Grandaddy appearance, and a grass snake for bait could not, and would never be repeated. The next opportunity to catch the legend of Down Back came a couple years later. I was fishing with bass in mind this time, and casting a red and white daredevil when I spotted him. He took it on the first cast. Wow! What a thrill! The fight was truly memorable as he headed straight out and away about 30 feet, and then made a sharp turn downriver. The speed of that bass was amazing as he went about 20 feet, turned, and headed upstream just as fast. After one last turn, and heading downstream again, the rascal leaped about 4 feet in the air and spit out that lure like a bullet! The moment and mental image were etched in my mind forever. The magnificent leap, the lure fired like a bullet for about 15 feet, and then Grandaddy Bass disappearing into the river turned out to be our last meeting. The show that day was worth more than any bragging rights. After years of trying, the impressive end to our sporting match left Grandaddy Bass undefeated.